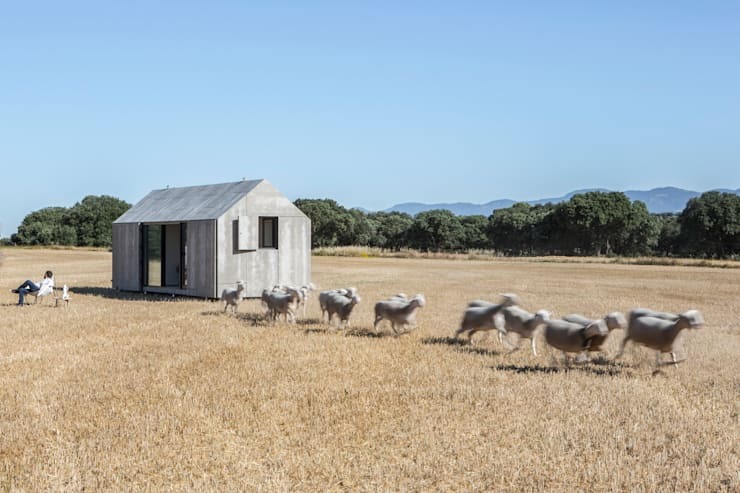 As its name suggests, this home by Spanish architects Ábaton is a travelling marvel that’s just dying to get out there and see the world. It’s neat, compact and as perfectly packaged as a birthday present. And it’s always looking forward to the next journey. 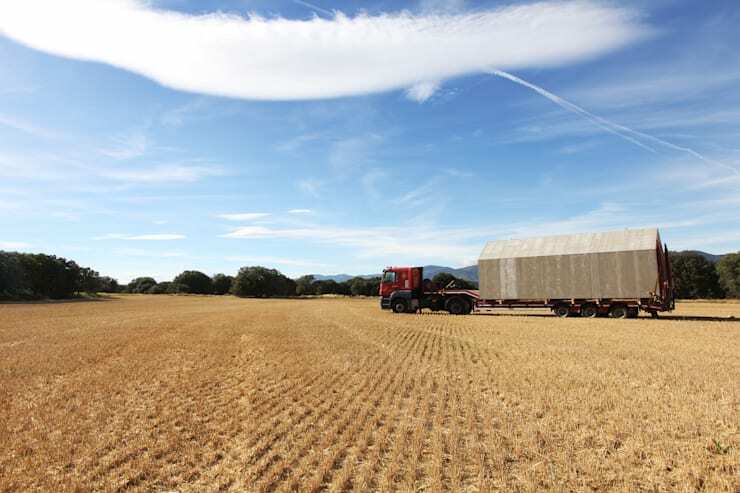 From a distance, the home could easily be mistaken for part of this truck. Most people wouldn’t realise what a unique cargo the driver is in fact responsible for delivering. 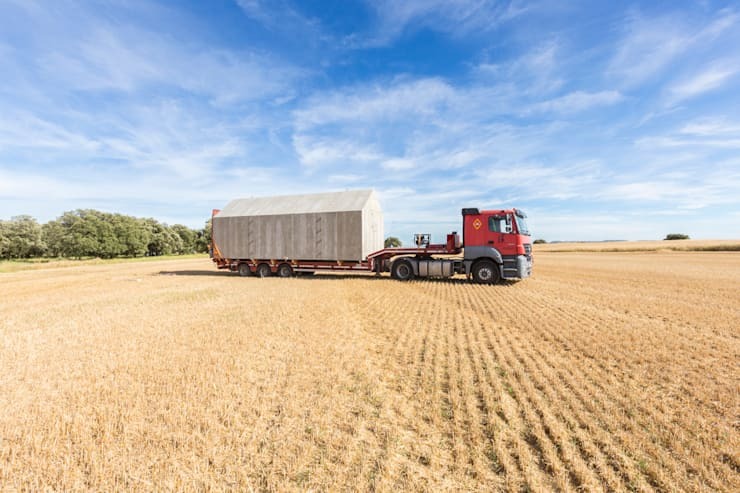 Having found the ideal setting for the house – and there’s no denying this gorgeous rural backdrop is about as ideal as it gets – it’s time to unload it with the help of a crane. 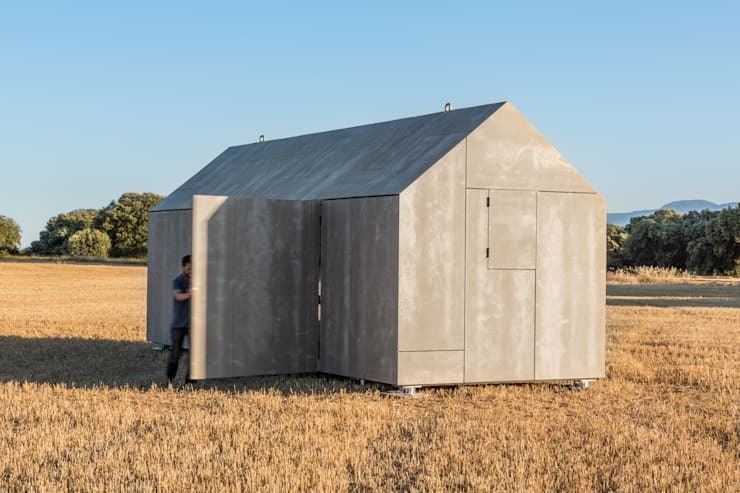 When it’s prepared for travel, the structure appears to be a featureless, house-shaped block. But once a suitable spot has been located, the unpacking gets underway. The windows and doors are uncovered, transforming the building. Evidently these sheep are a little disturbed by what they’ve witnessed, and who can blame them? 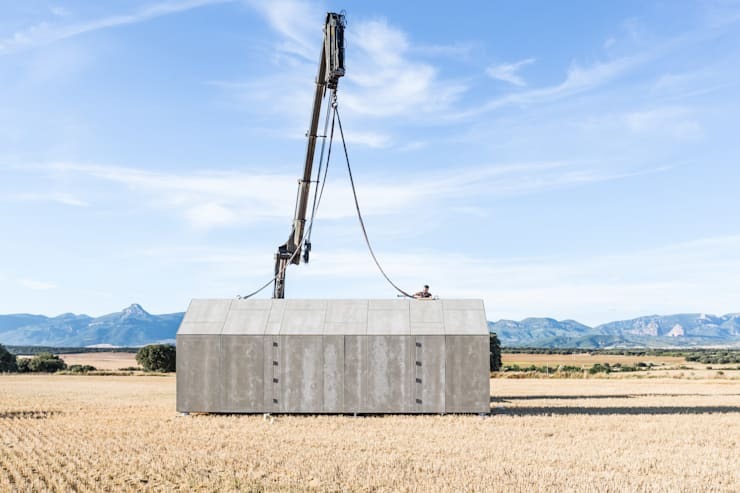 It can’t be every day that a fully-formed house pops up in their field with only minutes’ notice. 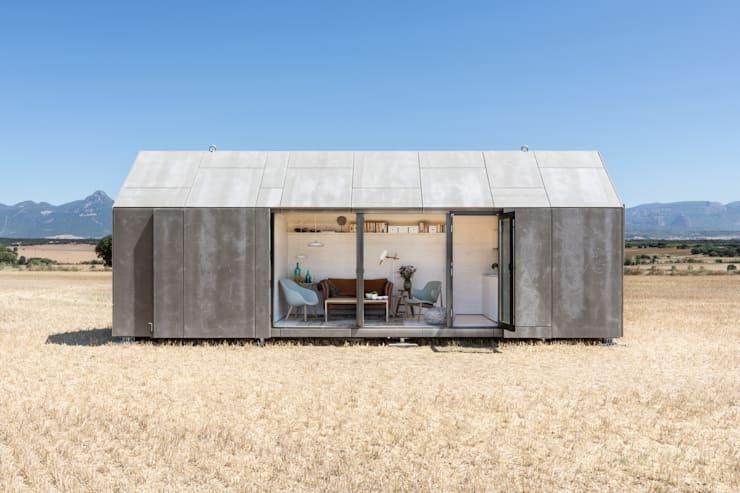 As impossible as it seems, the interior of the house somehow gives the impression of being much more spacious than the exterior would suggest. It has enough room not only for essentials, such as seating, lighting and books, but for pretty decorative extras like the flowers at the front off the photo and the coloured bottles in the background. 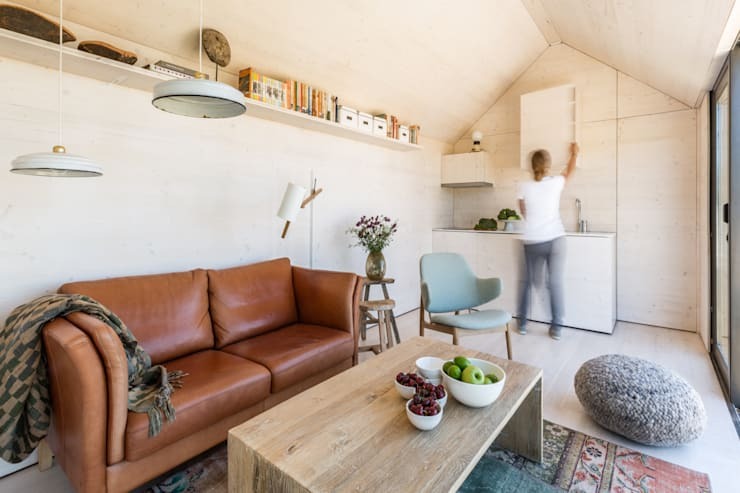 The overall look is just right for the home: bright, modern and uncluttered, with warmth supplied by the use of light-coloured wood and the old-fashioned, homey rug on the floor. Once uncovered, most of the wall in this room is actually made up of glass, blurring the lines between indoors and out and ensuring that the living area is always well lit. The kitchen space is very basic, and enthusiastic chefs will probably find it insufficient for their culinary needs. But it has worktop space and running water, so it offers all you need for preparing a simple salad to enjoy with wine and friends on a summer’s evening. In this picture we can also more clearly see the beautiful low-hanging lights which suit the look of the home so perfectly. 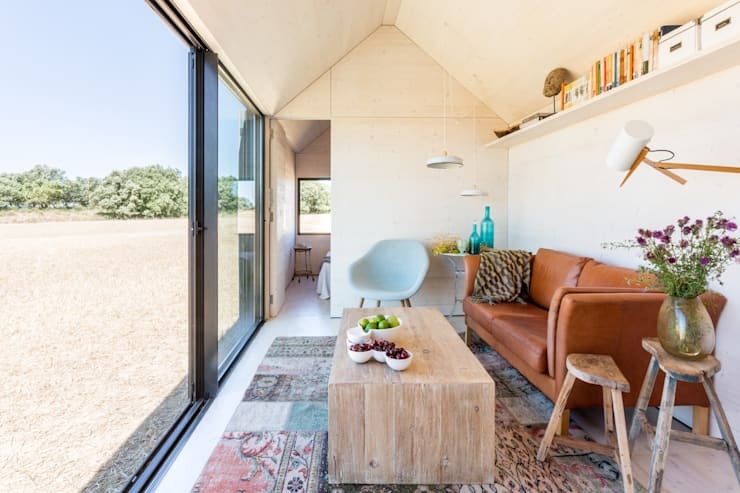 As with the other contents of the building, they are clearly modern without being self-consciously minimalist or overly refined, and they’re a great match for the countryside feel of the living room. Whether you’re inside this house looking out or outside looking it, the view is a strikingly beautiful one. 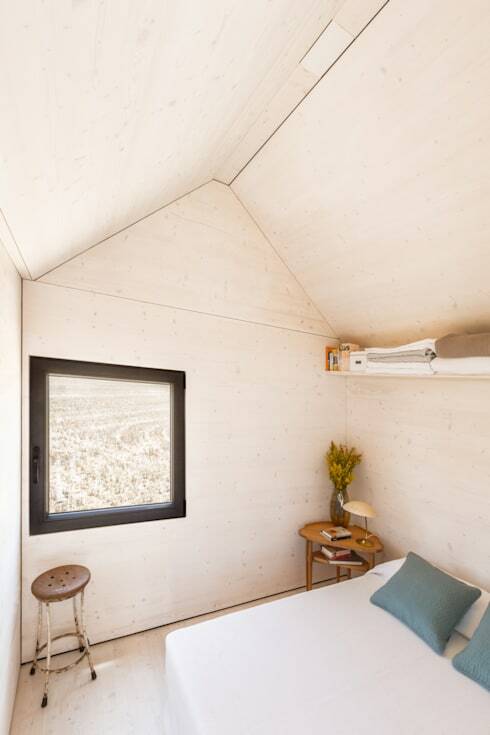 Another fold-away window illuminates the bedroom, the uncomplicated design of which is enhanced by the building’s lovely vaulted ceiling. Here, too, simplicity reigns, but small touches like the wildflowers in a vase and the beautiful sky blue shade of the pillows bring a little of nature into the space, just as in the living room. As in the living room, also, overhead shelving is essential in order to capitalise fully on the limited space available. This is a good tip to bear in mind if you have trouble fitting everything into your home (even though your home is likely to be at least a little bigger than this one). Where to next? The world is your oyster when your home has wheels. Could you live in a home like this? Why/why not?